The Chambers Border Walk is a walk which John Chambers has planned out around the perimeter of his property. There are various signs around the property from which you can begin the walk, the path begins in front of the orchard or can be accessed from next to the lodge. The walk is well sign posted and various points of interest are pointed out along the way, for example, John has placed a sign post in the direction where you are most likely to see the elusive Platypus on his property. There are some gum trees which are often raised as a point of interest. These are the Rose Gum Eucalyptus Grandus, and are easily identified by their pristine white coloured bark. These can be seen easily by looking up when you drive or walk along The Chambers driveway. 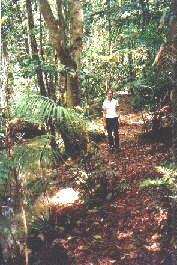 The common rainforest plants such as the wait-a-while (lawyer vine), tree fern and various epiphytes can be seen along the walk, as well as numerous insects and butterflies. You may also see some of the 170 bird species that are found on the property. The walk itself follows the creek for a little bit then turns to run almost parallel to the driveway. It continues in this way for a while and then gradually veers and crosses the driveway. At this point you are able to see some fine specimens of the Rose Gum, on your right is a water tank. The path continues to wind its way through some relatively open forest which is found behind the office. The path curves and continues down back towards the creek. Running back along the creek, there is a Platypus viewing area where these animals can be seen towards the end of the day. They are very shy though and to see them you must be very quiet and very patient. The path then climbs up the bank and returns you to the starting point, in front of the orchard.